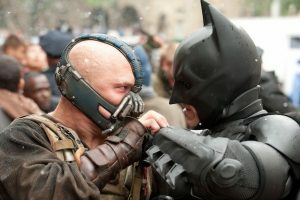 ‘The Dark Knight Rises’ comes with an amazing 1080p HD transfer and is presented in 1.78:1 aspect ratio, while every now and then switching to 2.40:1 for the IMAX presentation. 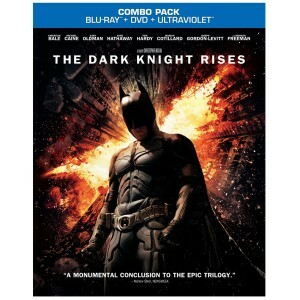 Although this looks unbelievable on blu-ray, it has been the talk of some controversy. That controversy was that of Warner Bros. using the IMAX master print with the 35mm print, which does not bode well for a flawless transfer. In most cases this would cause the image to have some major edge enhancement, crushed black levels, and banding. These things are NOT good for any HD video. However, that being said, all is well with this blu-ray release. You can rest easy. The colors are great, however, this being Batman, it uses gloomy and vague colors such as grays and lots of muted blues. The flesh tones are natural for the most part and might even be on the bright side to contrast with the vague and moody colors. The detail is impeccable and very sharp. You can make out every little flaw on the actors and every scratch on the Bat vehicles. There is a very small amount of some banding, but no aliasing and no real edge enhancement that distracts. The blacks for the most part run deep and inky but some are crushed, but this never is disappointing as i viewed it. Overall, this is a very impressive and amazing video presentation. This disc comes with a very powerful and flawless lossless DTS-HD 5.1 audio mix. This audio track will rattle the walls, shake the heavens, and make your neighbors come over to see what’s going on. It’s truly demo worthy. The dialogue is always crystal clear and very easy to understand. Yes, even Bane’s voice is easy to understand here. I knew they did some last minute work on his voice before the film was released in the theater and it worked, but on this blu-ray release, his voice is incredible. It is centered on all of the fronts and comes across very sinister, scary, and powerful. The sound effects of the gunfire, explosions, vehicles, and other big action sequences pack a giant punch and will make your speaker system have an aggressive workout. The directionality of the voices and sound effect are amazing as when bullets whiz by and off-screen actors are talking, you can hear them through the surrounds just fine. The score is epic and is loud and boastful, but it never once drowns out the dialogue or sound effects. This is a demo-worthy and flawless audio presentation. The Batmobile (59 mins.) 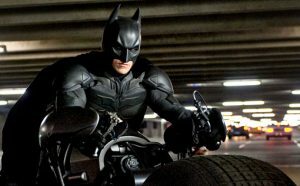 – This is an amazing and must-see extra all about the batmobile. And not just the one used in Nolan’s films, but all of the Batmobiles. There are interviews with Tim Burton and Joel Shumacher even, along with fans, artists, writers, and editors of the Batman franchise. You will get everything you wanted on the Batmobile here. This was a lot of fun to watch. Theatrical Trailers (8 mins.) – There are four trailers for the film located here. Ending The Knight (111 mins.) – I wish this was all part of one epic large documentary piece, but unfortunately it’s not. However, the material they cover is awesome. They cover everything in three different sections, which are titled Production, Characters, and Reflections. Each Section has several different featurettes that cover many and all aspects of the production and filming. I just wish that this was viewable to watch all at once without having to click the remote. Print Campaign art Gallery – Tons of promo artwork and posters for the film. Second Screen App – Take your iPhone or iPad, and while you watch the blu-ray you can do all sorts of fun stuff while you watch. This receives my highest recommendation. ‘The Dark Knight Rises’ is one of the finest films of the last decade and movies don’t get better or much more fun than this. It’s truly remarkable on all levels and definitely deserves more awards than it has received. The audio and video presentations are demo worthy here and the extras are amazing. Don’t hesitate to purchase this. This is a must-have. This entry was posted on Saturday, February 16th, 2013 at 10:41 pm	and is filed under Comics, Film, News. You can follow any responses to this entry through the RSS 2.0 feed. You can skip to the end and leave a response. Pinging is currently not allowed. You still think this is the best of the three? You crazy. Bane is the worst villain of the three. He’s scary, but not fantastical enough. I find his character too unimaginative to even be called a “super-villain.” Bane, at least in this movie, is nothing but a real-life terrorist. “The Dark Knight Rises” was a fantastic film, but didn’t blow me away like “The Dark Knight.” It didn’t offer any real surprises, nothing new, as opposed to its predecessors. I’ve yet to be compelled to see it a second time, unlike both “Batman Begins” and “The Dark Knight,” which I’ve watched a bunch of times and would again today. It mostly comes down to the villains, as they are the major differences between the films. Bane just wasn’t interesting enough.